Grab a great value car rental Dublin Airport deal now using our price comparison booking engine. We provide cheap deals 365 days a year. Secure a cheap Dublin Airport Car Rental deal today. It’s great to know that your rental car is ready and waiting for you as soon as you step off the plane at Dublin Airport. We provide great offers sourced from Ireland’s best car hire firms. Get the right deal at the right price. Dublin Airport has two terminals with the most recent terminal opening in October 2010. Terminal 2 is a state of the art building with superb facilities. It provides excellent shopping opportunities as well as a wide variety of places to eat and drink when compared with Terminal 1. Dublin Airport is located about thirteen kilometres from the city centre. There are a few bus services. Express services can be had through Air Coach – €8 single while Dublin Bus run a similar service for €7. There is also a regular 16A bus which runs to the airport however this can sometimes take over an hour. You should make a list if possible of places you would like to see before you arrive in Dublin. It can be hard to manage your time effectively when traveling with others who have different interests. Try to reach a compromise before you arrive so everyone is agreed on a plan of action. I know that sounds a little serious and not very spontaneous but from experience of traveling with family and friends I have found it to be good advice. Situated at the mid-point of Ireland’s east coast, facing the Irish Sea and England is the city of Dublin. The capital of the Republic of Ireland and the largest of Ireland’s cities. It remains a hotbed of history, culture and entertainment, as well as enjoying a rich sporting heritage. A trip to Dublin, however long or short your stay, is sure to be interesting. Dublin has a rich past, which is reflected in the city’s architecture. There is a beguiling mixture of the medieval, Georgian and modern styles. There is also the city’s considerable literary heritage to explore, think of names such as James Joyce or Brendan Behan, James Mangan or Partick Kavanagh. Such is Dublin’s literary heritage, it is actually now a UNESCO City of Literature. It is possible to visit landmarks and places associated with some of the most legendary names in Irish literature. A good place to start is at the Dublin Writers’ Museum. 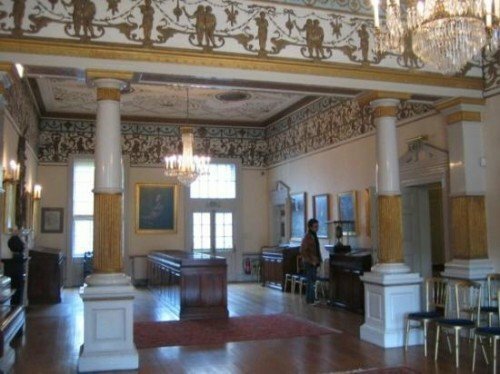 Contained in an attractive Georgian building, this museum offers over three centuries of letters, manuscripts, portraits and other memorabilia relating to writers who came from Dublin. Handily, the Dublin City Gallery is located just adjacent to the Writers’ Museum, meaning that you can double up your cultural intake. 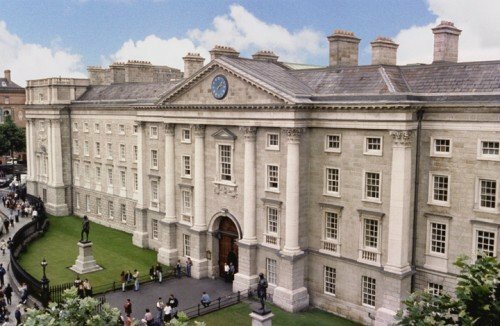 A trip to Trinity College Dublin is also to be recommended for anyone who wants to explore the cultural history of Ireland and its capital city. The Old Library houses some genuine Irish cultural treasures, including the Book of Kells. This 9th century gospel text was created by monks, and is one of Europe’s most significant literary treasures. Seeing it really is an awe inspiring and moving experience, letting you into a enigmatic era of Ireland’s history. If you want to enjoy Dublin’s literary heritage in a slightly different way, and combine it with a few pints of the local stout, then it is a good idea to go on a Dublin literary pub crawl. As well as visiting some of the city’s finest bars, you will also be treated to professional actors performing famous scenes from writers such as Joyce, Behan and Samuel Beckett. Dublin City remains one of the worlds most popular tourist destinations as the volume of visitors each and every year attests to. It is a vibrant young city which has come through some financial troubles throughout the years as well as more recently. It is a city steeped in history. There are few cities in the world that can match Dublin as a historical holiday destination. It is of course also known as a party town with an abundance of pubs and clubs. Guinness is probably the most famous Irish drink. You may wish to visit the Guinness Storehouse and take the tour. There is a complimentary free pint of the black stuff at the end of each tour. Dublin is hardly known for its warm climate so if you are feeling a cold chill in the evenings, you may wish to relax with a hot Irish whiskey or an Irish Coffee. When you book a Dublin Airport rentacar deal, you open up many touring opportunities further afield. Ireland is a small country and driving is a great way for a visitor to see as much of it as possible during their stay. It’s a far better option than public transport in most cases with car hire deals available from as little as €10 per day. There are some wonderful day trips from Dublin which are worth looking into such as Glendalough and Trim Castle to mention just a couple. If you fancy getting some fresh air then there are also plenty of options in Dublin. A little known feature of the city and the surrounding area is the number of great beaches that are within easy reach. Many have great sand dunes to walk along, coupled with amazing views. 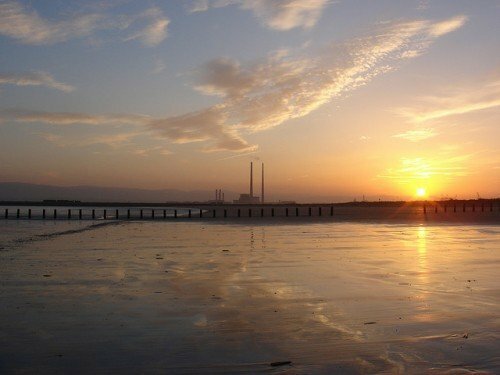 Dollymount Strand is easily accessible from the city, and is situated on North Bull Island. Killiney Beach is rocky and the place to look for bright pebbles and other things among the rock pools. There are also some superb views of the Wicklow Mountains in the distance. 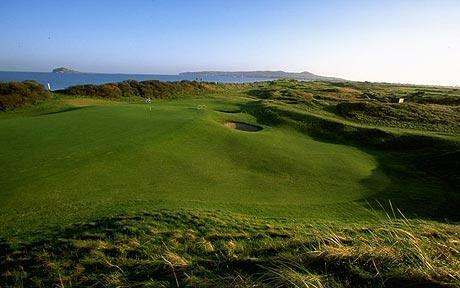 For golfers, Dublin also has plenty of great options. Some of Europe’s finest links courses are within easy reach of the city, while there is a huge choice of around 40 courses to choose from in total. Many of them enjoy beautiful settings amid the rugged scenery of Leinster. Two great courses are Portmarnock Golf Club and Deer Park Golf Club, but the range of options available could keep the keenest golfer occupied for years. If golf seems a little too staid or tame for you, then you may well prefer to visit the Dublin Mountains. These hills offer a good range of outdoor leisure options, including hiking, orienteering, climbing and mountain biking. The forests and hills are also great to just sit in and enjoy the view, which is excellent. The Dublin area is also well-known for its castles, and there are several which visitors will find interesting. Ardgillan Castle, one of the better known local fortresses, was built in 1738 and enjoys a great setting on a rocky coastline. A rose garden and walled garden, as well as woodlands, means that the grounds are very pleasant to walk around. 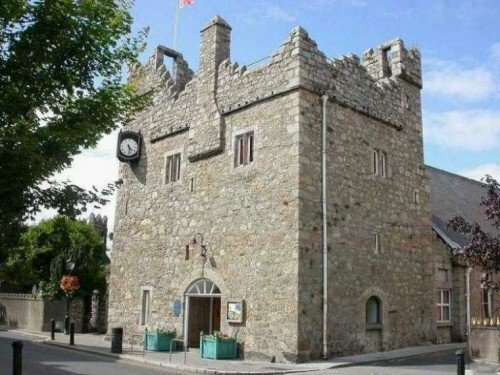 Dalkey Castle and Heritage Centre is an older structure, dating back to the 14th century, and the guided tours which are available offer great insight into the history of the buildings. Live theatre performances of many kinds sometimes take place here too. The suburb of Howth, accessible by public transport and just 10 miles or so north of Dublin city centre, is a great choice for a day trip from the city. You can use the DART train or bus to get there. The waterfront with its piers is a good place to start an exploration, and a walk along the coastal path will certainly work up an appetite which means that you will have a great excuse to visit one of the town’s superb seafood restaurants. The National Transport Museum is also situated in Howth. For a light hearted visit, especially if you have children travelling with you, a trip to the National Leprechaun Museum is highly recommended. Here, visitors are treated to an exploration of the sometimes dark side of Irish myth and magic. Celtic legends and ghostly tales are what you can expect here, and you should leave knowing much more about the folklore which gave rise to the tales of creatures like leprechauns. Comparing quotes from the the various companies operating at the airport is the most efficient way of finding the right car rental. You can do it in just seconds. Renting a car in Ireland is an affordable and smart option for visitors. Ireland is a small place so you can easily hop in your car hire and visit locations such as Galway, Derry or the Shannon region. We also offer excellent value car hire Cork Airport prices. 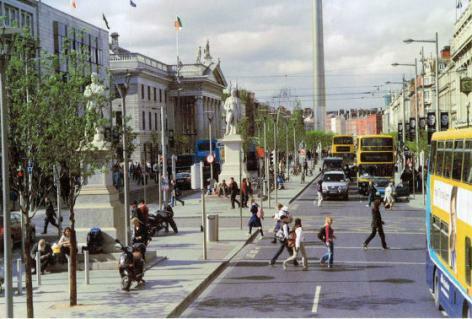 The main street in Dublin is called O’Connell Street. There you will find the Spire as well as other well known spots such as the Gresham Hotel, Easons Books and the Savoy Cinema. Henry Street just off O’Connell Street is a great place for shopping however Grafton Street on the south side of the city is probably your best bet to get some serious shopping done. Temple Bar though more renowned for its nightlife also has some interesting shops such as vintage clothes shops, tattoo parlors and the IFI Cinema. One of the best ways to see what Dublin has to offer is to take a walking tour of the city. There are many of these available, with different tours focusing on different aspects of the city. The Hidden Dublin tours provide visitors with insights into the history of the city, through the Celtic era, the bubonic plague times and the 19th century. It even takes in the burnt-out shell of The Hellfire Club, a supposedly haunted hunting lodge. Other tours explore more of what contemporary Dublin has to offer in the way of street art, pop up shops and the less obvious aspects of Dublin’s history. Dublin really is one of Europe’s premier holiday destinations. Whether you like sport and the outdoor life, food and drink, or literature and history, there is something to keep you busy in this part of Ireland. It is a city of magical memories just waiting to happen for you to take back home.